Patterson's Creek Viaduct, on the Midland Railway at Otarama. 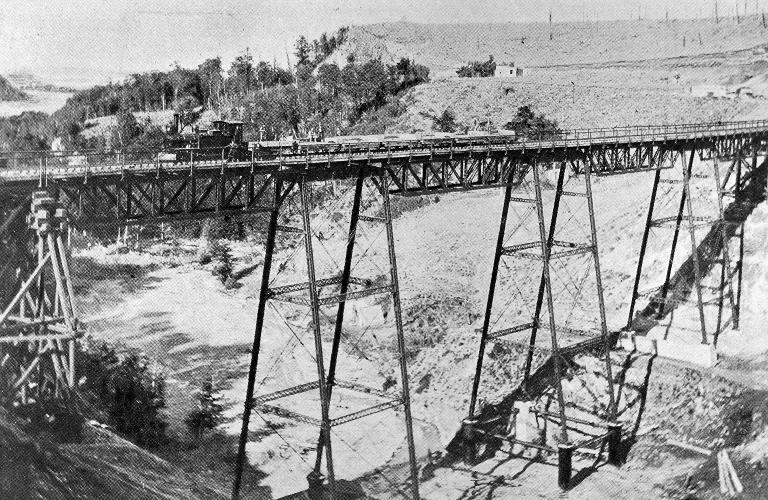 Caption: Patterson's Creek Viaduct, on the Midland Railway at Otarama. Description: The Midland Railway Company built the line west of Springfield to Otarama, which was the terminus in 1895 when the Company failed and the work was taken over by the Government. Otarama was a popular picnic excursion destination in the mid 1890s. Around the turn of the century, work was proceeding at Pattersons Creek. The Pattersons Creek Viaduct was built by Scott Bros., Christchurch. It is 120 feet in height and 620 feet in length.